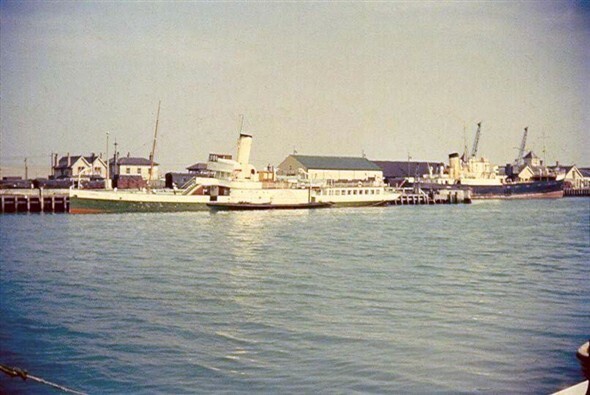 This unusual visitor is the excursion paddle steamer Consul, operated by Cosens of Weymouth. She's moored at the corner of the East Quay, opposite the tug stage. The date must be after 1960, as records show she did not operate east of the Isle of Wight until then. Similar photos at Newhaven give a date of 1963. The 'Dieppe screw' cargo steamer to the right is either Rennes or Nantes. Just to the left of Consul's mast are the Station Master's house and the Bonded Warehouse. Consul was an old lady by this time, having been built for a rival excursion steamer company, P A Campbell, as Duke of Devonshire in 1896! She was taken over by Cosens and renamed Consul in 1938, but was suffering boiler and engine problems by the time this photo was taken. This page was added by John Hills on 26/04/2009. The ps Consul would have been here during the summer of 1962. I was working at the time for the Lyons Maid Ice Cream company in Estate Road . We fitted an ice cream freezer in her, I think that was the purpose of her visit.